bronchopneumonia resulting from the inhalation of foreign material, usually food particles or vomit, into the bronchi; pneumonia developing secondary to the presence in the airways of fluid, blood, saliva, or gastric contents. an inflammatory condition of the lungs and bronchi caused by inhaling foreign material or acidic vomitus. Compare bronchopneumonia. See also pneumonia. observations Aspiration pneumonia may occur during anesthesia or recovery from anesthesia or during a seizure of acute alcoholic intoxication or other condition characterized by vomiting and a decreased level of consciousness. Patients receiving enteral feeding therapies may also be at risk. interventions Treatment consists of prompt suctioning of the bronchi and administration of 100% oxygen. Continued artificial ventilation may be required. As long as oxygen is administered, frequent analyses of blood gas levels may be indicated. Corticosteroids may be given to diminish inflammation. The sputum is cultured regularly, and any bacterial infection thus diagnosed is treated with an appropriate antibiotic. nursing considerations The pulse rate and quality of respirations, level of consciousness, and skin color are carefully monitored. An oral airway is left in place until the patient's condition improves, and secretions are removed by suction as necessary. Infection and respiratory failure are frequent complications. Aspiration pneumonia may be prevented by positioning unconscious patients with the head elevated 15 to 30 degrees and turned to the side and by paying careful attention to the maintenance of enteral feeding therapy and an adequate airway. An infectious process characterised by inhalation of colonised oropharyngeal material into the respiratory tract, which most commonly occurs in patients with impaired sensorium. • Hospital acquired—Staphylococcus aureus, Enterobacteriaceae, Pseudomonas, mixed oropharyngeal flora. • Community acquired—Streptococcus pneumoniae, H influenzae, mixed oropharyngeal flora. Progressive respiratory depression, hypoxia, tachypnoea and tachycardia; the tracheobronchial tree “sweats” a thin frothy fluid. Poor oral hygiene, clouded sensorium (drugs, alcohol, anaesthesia, coma, CVA, seizures), impaired gag reflex (intubation, myopathy, neurologic disorders, tracheostomy, vocal cord paralysis), oesophageal dysfunction (achalasia, strictures, tumours), others (elderly, feeding tube, delayed gastric emptying, critical illness). Aspiration pneumonitis Pulmonology A condition characterized by the inhalation or inappropriate passage of highly acidic gastric content–food, gastric acid, vomitus-into the respiratory tract, a clinical event most common in the comatose; after the insult, there is progressive respiratory depression, hypoxia, tachypnea, and tachycardia; the tracheobronchial tree 'sweats' thin frothy fluid; lung parenchyma is acutely inflamed, hemorrhagic and edematous with atelectasis and necrosis Mortality Up to 70%. See Gastric aspiration, Pneumonia. Bronchopneumonia resulting from the inhalation of foreign material, usually food particles or vomitus, into the bronchi; pneumonia developing secondary to the presence in the airways of fluid, blood, saliva, or gastric contents. Pneumonia caused by the inhalation of infected or irritating material, such as vomited stomach contents. Q. What Causes Aspiration Pneumonia? My father is hospitalized with aspiration pneumonia. What causes this? A. Aspiration pneumonia is a pneumonia that develops due to the entrance of foreign material that enter the bronchial tree (air tubes), usually oral or gastric contents (including food, saliva, or nasal secretions). Aspiration pneumonia represents a either a bacterial infection or a chemical inflammatory process due to inadequate swallowing mechanism. The most common type of pneumonia seen in this study is hospital-acquired pneumonia and aspiration pneumonia. It would be good to see them bring their expertise into hospitals to provide comprehensive oral care for older adults to prevent aspiration pneumonia, and deconditioning. These deficits were aspiration pneumonia secondary to dysphagia, urine flow disorder and urinary tract infection developed in association with residue. In addition, the rate of mortality associated with aspiration pneumonia among patients with ischemic stroke is approximately 35% (Hinchey et al. The most common clinical signs of oesophageal tumours are caused by total or partial obstruction of the oesophagus; therefore, dysphagia, hypersalivation, regurgitation, anorexia, weight loss, and aspiration pneumonia are commonly reported (WITHROW, 2013). This leads to aspiration pneumonia, which is the most life-threatening part of most myasthenia gravis cases. 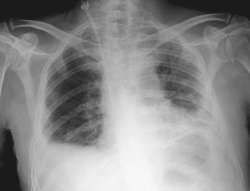 The final diagnosis was septic shock associated with ARDS, due to aspiration pneumonia. If the stomach is empty, the chance of severe aspiration pneumonia is lessened. We describe a case of NMS in a patient who presented with acute onset of altered mental status complicated with aspiration pneumonia. Experts have found that force-feeding causes esophageal tears and splits, liver rupture and failure, heat stress, and aspiration pneumonia - and, by the company's own admission, some 15,000 ducks on the farm die every year before they make it to slaughter," PETA spokeswoman Wendy Wegner (http://www. Dysphagia can place someone at high risk for comorbidities such as aspiration pneumonia, protein and energy malnutrition, infection, and decreased quality of life (4,5). These were considered as aspiration pneumonia in 12 (41.